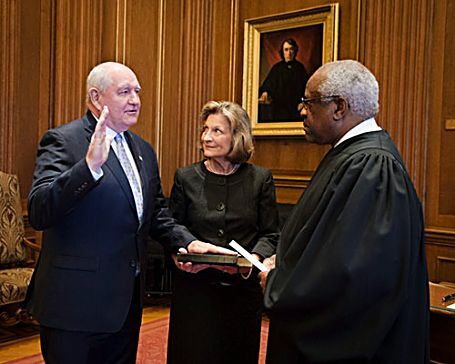 Sonny Perdue, with his wife Mary, takes the oath of office administered by Associate Justice Clarence Thomas in the U.S. Supreme Court Building, becoming the 31st U.S. Secretary of Agriculture. WASHINGTON, D.C. — Sonny Perdue was sworn in as the 31st U.S. Secretary of Agriculture by fellow Georgian and Associate Justice of the U.S. Supreme Court Clarence Thomas in a brief ceremony at the Supreme Court building. The U.S. Senate confirmed Secretary Perdue by a vote of 87-to-11 on April 24. After Secretary Perdue took the oath of office, he addressed employees at the U.S. Department of Agriculture before getting to work on his first day. Also that morning, USDA launched his official Twitter handle: @SecretarySonny. Sonny Perdue came by his knowledge of agriculture the old- fashioned way: he was born into a farming family in Bonaire, Ga. From childhood, and through his life in business and elected office, Perdue has experienced the industry from every possible perspective. Uniquely qualified as a former farmer, agribusinessman, veterinarian, state legislator, and governor of Georgia, he became the 31st U.S. Secretary of Agriculture on April 25, 2017. Additionally, Perdue recognizes that American agriculture needs a strong advocate to promote its interests to international markets. The U.S. is blessed to be able to produce more than its citizens can consume, which implies that we should sell the bounty around the world. The relationship between the USDA and its trade representatives, as well as with the U.S. Trade Representative and Department of Commerce, will be vital. The work of promoting American agricultural products to other countries will begin with those relationships and will benefit us domestically, just as it will fulfill the moral imperative of helping to feed the world. Perdue has pledged to be an unapologetic advocate for American agriculture. Under Secretary Perdue, the USDA will always be facts-based and data-driven, with a decision-making mindset that is customer-focused. He will seek solutions to problems and not lament that the department might be faced with difficult challenges. The work ethic cemented in him by his farming roots has remained with Sonny Perdue throughout his life. As a younger man, he served his country in the U.S. Air Force, rising to the rank of Captain. After earning a doctor of veterinary medicine from the University of Georgia, he put that training to use in private practice in North Carolina. As a member of the Georgia State Senate for 11 years, he eventually ascended to the position of President Pro Tempore as elected by his senate colleagues. As a two-term governor of Georgia, he was credited with transforming a budget deficit into a surplus, dramatically increasing the student performance in public schools, and fostering an economic environment that allowed employers to flourish and manufacturers and agricultural producers to achieve record levels of exports. He followed these accomplishments with a successful career in agribusiness, where he focused on commodities and transportation in enterprises that have spanned the southeastern U.S. These experiences have proven invaluable in his current role as principal advocate for American agriculture and all that it serves. Perdue is a strong believer in good government, in that it should operate efficiently and serve the needs of its customers: the people of the U.S. As a state senator, he was recognized as a leading authority on issues including energy and utilities, agriculture, transportation, emerging technologies and economic development, and for his ability to grasp the nuances of complex problems. As governor, he reformed state budget priorities, helped Georgians create more than 200,000 new jobs, and promoted his home state around the world to attract new businesses. In 2009, the Reason Foundation’s Innovators in Action magazine recognized Perdue as a leader who “aggressively pursued new strategies to increase the effectiveness and efficiency of government and deliver better value at less cost to taxpayers.”In addition, he was named “Public Official of the Year” in October 2010 by Governing Magazine. To this day, his thoughts are never very far from the wishes of the citizens — the true owners of the government.